Minister for Financial Services, the Hon. Bill Shorten MP, has helped Financial Counselling Australia (FCA) and CentaCare Wilcannia-Forbes launch a new front in the Do Not Knock campaign aimed at reducing harmful door-to-door sales practices in Indigenous communities. 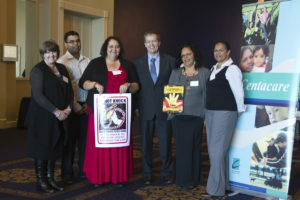 Minster Shorten launched the project, which includes a new ATSI Do Not Knock sticker, at Financial Counselling Australia’s National Conference on 15 May 2012. 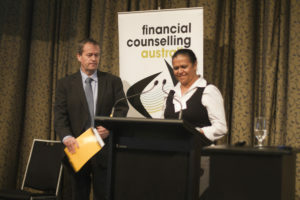 Fiona Guthrie, Executive Director of FCA, said the genesis for the project was the first hand of experience of financial counsellors seeing people in remote Aboriginal or Torres Strait Islander communities being targeted by shonky door-to-door salespeople. “In one case we had a door-to-door company targeting remote ATSI communities and selling people first aid kits worth around $50 for $300-$500. Whether it is high pressure selling, an inability to say no to someone at the door, or a misleading salesperson, this type of practice needs to be wiped out and we hope the project we’re launching will do just that,” said Ms Guthrie. “Many companies set up direct debits from customers’ bank account to ensure they get paid. Sadly the money is debited regardless of the customer’s bank balance and can often force the account into the red—resulting in the account holder being hit with a dishonour fee,” said Mrs Edwards. To complement the new do not knock materials, CentaCare Wilcannia-Forbes has also published Don’t get clawed over the phone which focuses on telemarketing and how to say no. Mrs Edwards said many customers’ politeness led to them being up signed up for products over the phone that they didn’t need, want or could afford. Financial Counselling Australia has also put together a series of innovative community education “flash cards” about door-to-door selling. Community workers can download the materials from the Centacare Wilcannia-Forbes website. The packs can also be purchased from Centacare Forbes Wilcannia; contact them directly for up to date pricing information on 02 6850 1788.